Using EM in the veg garden. Now that summer has arrived its been a busy time planting out the veg and this year I am going to see how well they do if I use EM in the veg plot. Earlier in the year, once I had added the contents of the compost bins, along with some horse muck and spread it over the veg plots, I then sprayed it all with activated EM (or garden Yoghurt) and covered it with a large plastic sheet. This was to get some warmth into the soil and help the EM do its bit. When I later came to rotovate the soil, it was wonderfully friable. The plastic sheet went back until a couple of weeks ago, once the sun finally arrived. A couple of weeks ago the first broad beans went in – they had only had a couple of leaves at that point. When they were planted out, they all had some bokashi bran added to the holes they went into. They are now shooting ahead. Last Wednesday, the runner beans went in. They too had just merged from the propagating pots. As with the broad beans, some bokashi bran was sprinkled into the holes and off they go! Watch this space and see how they do! Six weeks on and the veg are flourishing (as are the weeds!). 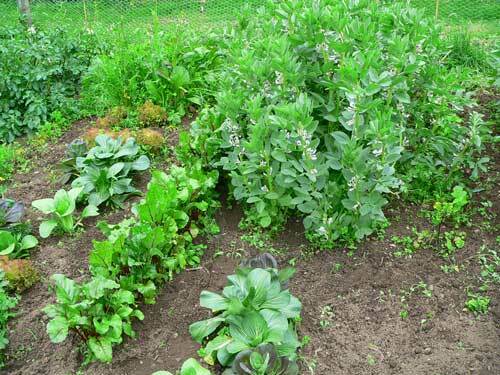 Despite the wind and the rain, the broad beans are strong and healthy, but as yet no pods – plenty of flowers though. Lettuce are doing well, as are the spuds – dug my first root of Mayan Gold I got at the BOG potato day, however will need to leave then another couple of weeks me thinks. Pak Choi have been brilliant and has not bolted yet – need to get some more germinating! 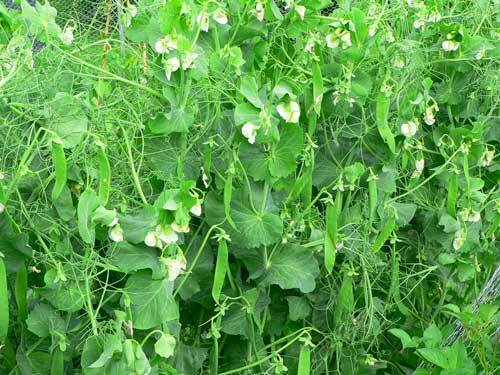 The peas in the other plot are heaving with pods, should have some nice fresh peas next weekend! Looks to me that the EM is really working it’s magic, as I’ve never had a crop like this before and the weather hasn’t been brilliant. All the veg look really healthy, despite all the wet weather there’s no mildew on the peas. 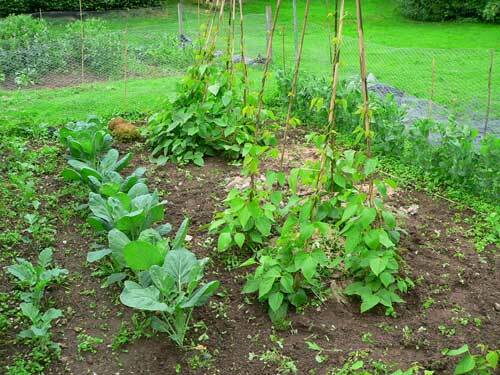 The runner beans are just starting to ‘take off’. There are two wigwams, one of which had a big dollop of bokashi mixed into the center about 2 weeks ago – you can see the difference in growth (its the far one), so have added some to the other. Lets see what they look like in a month! The wire is not to keep out rabbits – instead my destructive chickens!